This 7.5x55 Swiss ammunition will make a fearsome deer rifle out of your bolt-action. Each cartridge in this box of 20 fires a 165 grain soft point bullet at a muzzle velocity of 2730, giving it excellent long-range accuracy and the ability to mushroom swiftly and knock a buck down in its tracks. A boat tailed profile provides stability in flight and more consistent trajectories in the face of changing wind conditions. 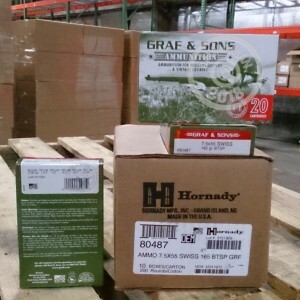 These cartridges are manufactured in Grand Island, Nebraska by Hornady under a contract with Graf & Sons. They use non-corrosive Boxer primers and reloadable brass cases. All orders over $99 at AmmoMan.com include free shipping, so stock up for all your guns at once to save!